of a world at war with light. This entry was posted in Dealing with Difficulties, Dreams, Imagination, Living in the Light, Nature, Poetry, Possibilities, Rain, Summer and tagged free verse poem, light, lily, photography, poem, rain, sunbeam, waorld at war. So very beautiful … to release freckled sunshine into the madness of the world! Thanks Daniela. I hope your summer is giving you lots of pleasure so far! You are most welcome … love your ability to tell a story within a poetry. It is middle of winter over here in New Zealand -:)! I forgot you were out there. I always remember the Croatia connection, and then forget you moved. 😦 How is the winter, then? Cold, went, windy! Hopefully not for much longer … here is hoping. And yes, there is high summer in Croatia right now! Thanks! 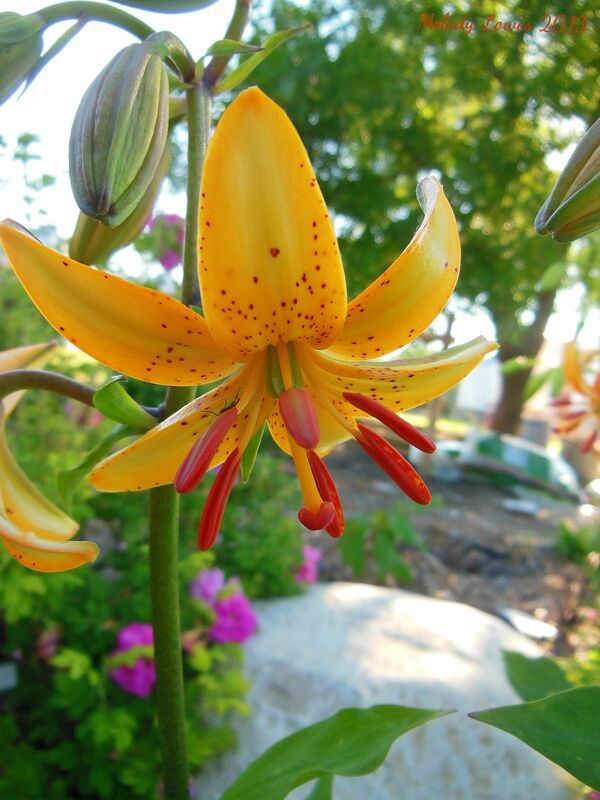 It’s a martagon lily called ‘Cadense’, rather a lovely name. Oh my goodness gracious, you’ve packed a lot of Power in this lovely one, Mel!!! Wise to store that sunbeam. I forgot and now it’s raining! Beautiful lily. I will have to be quick! Love the thought of releasing freckled sunshine into a world at war with light. Beautifully told! Thanks Shannon! How is your summer going so far?? So far, so good! It is always a blessing to have some time off. 🙂 How about you?